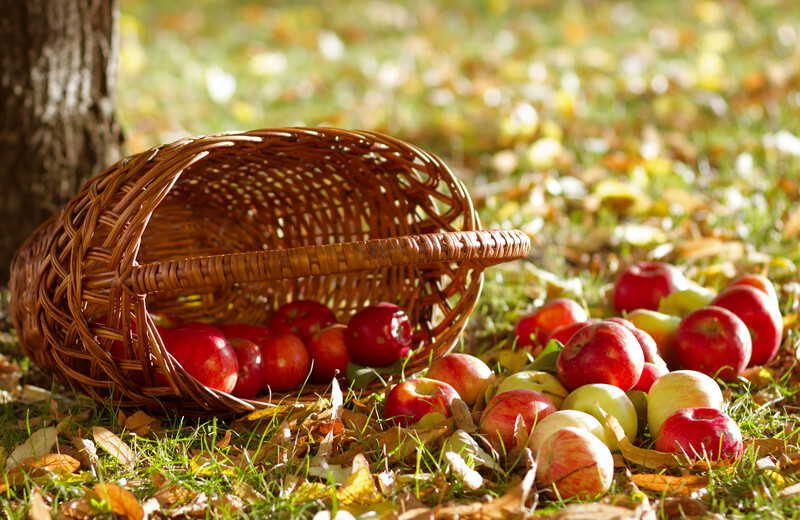 Apple Cider Vinegar has been used in cuisine and medicine since people started farming apples. Hippocrates, referred to as 'the father of modern medicine', is known to have prescribed vinegar during the 4th century BC. Every household should have a bottle of Apple Cider Vinegar, it's huge range of health benefits, its ability to manage weight and its short term use for sore throats, cold & flu or to ease digestion and heartburn. 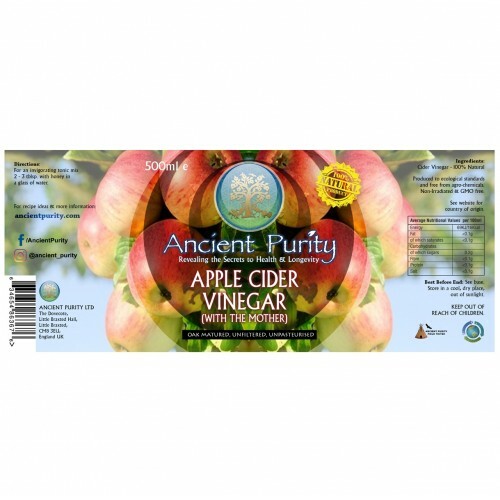 Apple Cider Vinegar is referred to in many religious and historical texts as a remedy for many ailments, it is Ancient Purity embodied in liquid. The expression "an apple a day keeps the doctor away" has a lot of well known facts to back it up, as apples are well known to be extremely good for us, containing all manner of beneficial nutrients, including pectin, vitamins, fibre and minerals, many people consider Apple Cider Vinegar to be the ultimate form of the apple, with many more of its wondrous benefits unlocked during the fermentation process. Many of the Apple Cider Vinegars that are found in health food shops and supermarkets have been pasteurised and filtered. This destroys and removes the 'Mother' a term for the ball of living enzymes that floats around in the apple cider vinegar as well as other nutrients, making it pretty much useless for anything other than a table condiment, also a lot of these vinegars are made from apples grown using harmful chemical fertilisers and pesticides. Natural (undistilled) organic, raw ACV can really be called one of Mother Nature's most perfect foods. It is made from fresh, crushed apples which are then allowed to mature naturally in wooden barrels, as wood seems to "boost" the natural fermentation. Natural ACV should be rich, brownish colour and if held to the light you might see a tiny formation of "cobweb-like" substances that we call the "mother." Usually, some "mother" will show at the bottom of the ACV bottle the more it ages. It never needs refrigeration. You can also save some "mother" and transfer it to work in other natural vinegars. 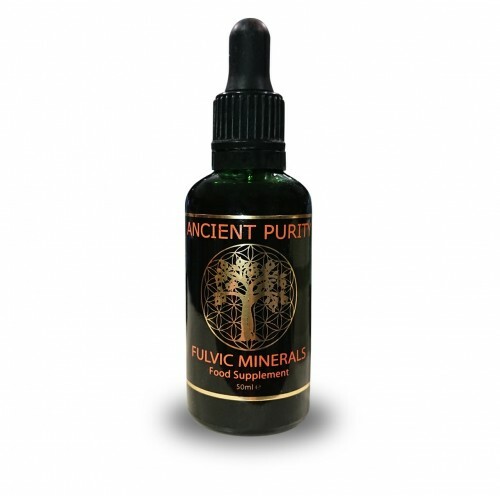 When you smell natural ACV, there's a pungent odour and sometimes it's so ripened it puckers your mouth and smarts your eyes. These are natural, good signs. Helps with toning the skin. Apple Cider Vinegar is good in helping balance blood sugar levels, apple cider vinegar also assists in weight loss, since insulin will not direct sugar to be stored as fat. Apple Cider Vinegar is also wonderful for pets, including dogs, cats, and horses. It helps them with arthritic conditions, controls fleas & barn flies, and gives a beautiful shine to their coats! If you can get over the taste of apple cider vinegar, you will find it one of the most important natural remedies in healing the body. As a wonderful side effect of drinking apple cider vinegar every day, we've discovered that it brings a healthy glow to one's complexion! This is great news if you suffer from a pale countenance. Our Apple Cider Vinegar is made from organically grown apples, contains absolutely no additives, the apple cider vinegar remains in its natural state, meaning that the 'Mother' is intact. 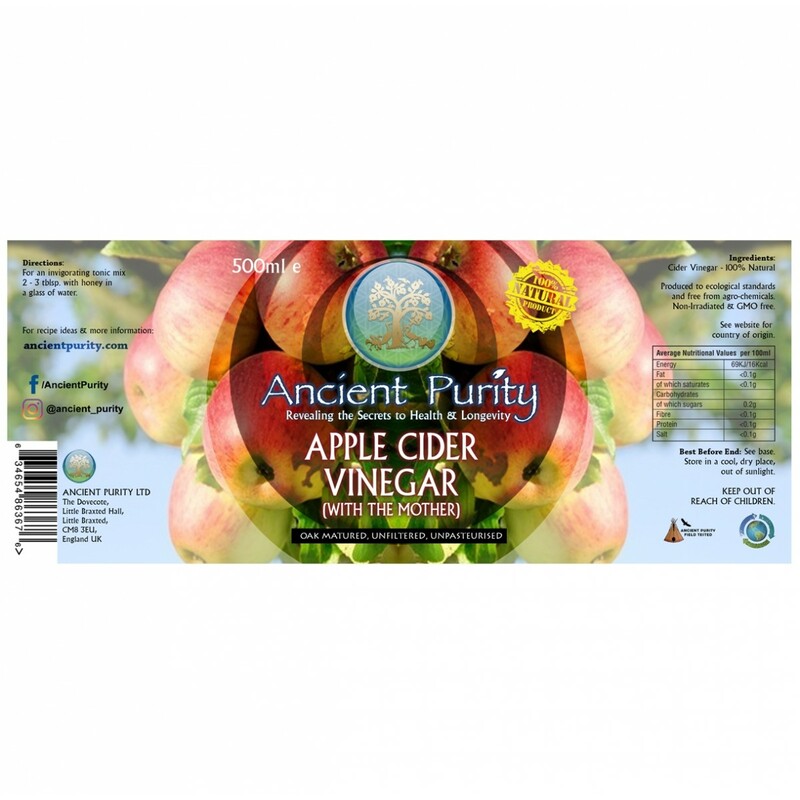 The Mother in Apple Cider Vinegar is quite simply a ball of beneficial living enzymes which is rammed with goodness is largely responsible for the many beneficial properties of the vinegar. You can get the 'Mother' in your bottle to grow by leaving it in the sunlight. There is on going research on Apple Cider Vinegar, as well as extensive testimonials online regarding it's use and effectiveness on weight-loss, some studies show that Apple Cider Vinegar can increase satiety, helping you eat fewer calories leading to weight loss. It has effect on lowering blood sugar and insulin levels. For example, if people take vinegar along with a high-carb meal, they get increased feelings of fullness and end up eating 200–275 fewer calories for the rest of the day. A study in 175 people with obesity showed that daily apple cider vinegar consumption led to reduced belly fat and weight loss. This study went on for 3 months, so it's fair to say that as we already thought at Ancient Purity, Apple Cider Vinegar for weight-loss is more of a long term solution, taking it regularly or even daily over time, should help one to lose weight, it's a simple yet effective method to keep yourself lean. 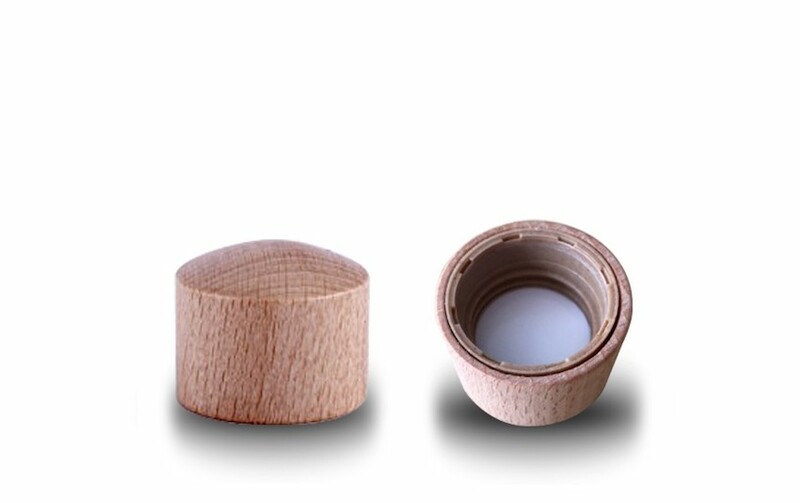 Ancient Purity believe strongly in working with the earth for now and future generations, we also believe in respecting every essence that goes into your body, so why not choose a 100% eco beechwood lid for your bottle instead of plastic. Made from Beach Wood, Natural Oil and Wax. NOTE: Please select ECO Lid when purchasing, plastic comes as standard. ECO Lid is shown in product photo. Our skin is naturally acidic and when these pH levels are out of balance, it can lead to breakouts, clogged pores, or itchy and irritated skin. Beauty blogs have been talking about how apple cider vinegar can be used as a skin toner, citing that its acid pH restores the skin's acid mantle and improves the skin barrier function. Some people use apple cider vinegar for acne. Although there is no substantive research on this correlation, people have reported seeing improvements in skin inflammation and breakouts. You can try it out by diluting a small amount of apple cider vinegar with water and rubbing it onto your T-zone area or other dry spots with a cotton ball to help prevent breakouts and minimize blemishes. Varicose veins are large, dilated veins that are commonly seen on the legs and can be associated with pain and discomfort. A study was performed to test the effects of topical apple cider vinegar application to treat varicose veins. The group of study subjects who received the apple cider vinegar application had a significant reduction in symptoms, including cramps, pain, itching, pigmentation and discomfort in the legs. 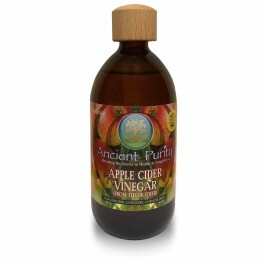 The apple cider vinegar did not make the varicose veins disappear and only helped with symptoms. One of the largest components of apple cider vinegar is acetic acid, an acidic solution that can match the pH of hair (ranges from 4-5 pH). This allows you to cleanse the hair and scalp without upsetting its pH balance. There have also been claims stating that the application of apple cider vinegar can help seal and protect hair follicles, leading to less hair loss. To date, however, there has been no direct research on apple cider vinegar’s benefits for the hair. Putting apple cider vinegar on your locks has the potential to smooth and strengthen them. Combine one cup of water with 2-3 tablespoons of apple cider vinegar. Shampoo and condition your hair as you normally would and then slowly pour the mixture over your entire scalp, allowing it to run down the length of your hair (make sure to close your eyes!). Massage the mixture into your scalp and then rinse thoroughly. Nutrition information: Typically 5% vinegar Energy 16kcal / 69kJ - Protein - Carbohydrate 0.2g of which sugars - Fat. 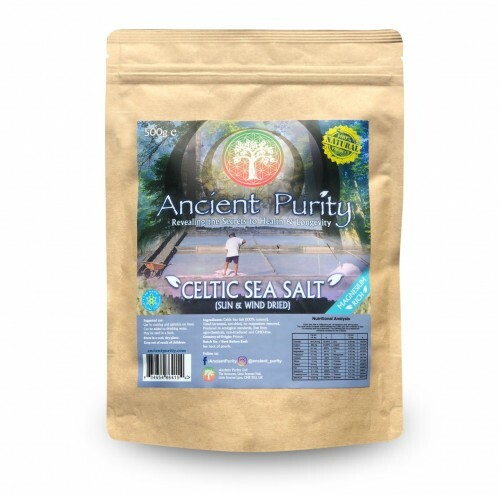 Produced to ecological standards, free from agro-chemicals, non-irradiated and GMO-free. 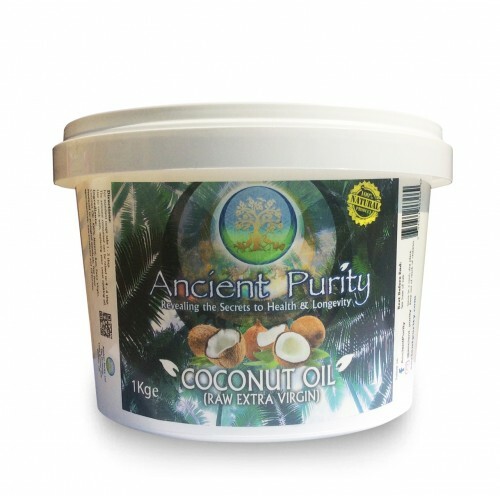 Organic at source = Our supplier has certified them organic, but Ancient Purity does not register its products as organic. We add nothing and take nothing out. For an invigorating tonic mix 2-3 tablespoons of cider vinegar with honey and water. It's suggested that Apple Cider Vinegar has such curative abilities because it causes ones pH levels to become more alkaline. If you are going to try apple cider vinegar for allergies, or even to prevent sickness, we suggest you do an investigation of your own by buying a pH test kit. You can use a pH metre to test your urine or saliva to see if you are more alkaline or acidic during an allergy attack, virus or bacterial infection. Once you ascertain your pH levels, you can adjust adjust your dosage of Apple Cider Vinegar accordingly. If you live in a highly polluted area where allergies and sinus infections are rampant, your system may better balance itself with a small dose of Apple Cider Vinegar each day. Ultimately we suggest you experiment with a pH meter to find the pH balance your body functions optimally at. 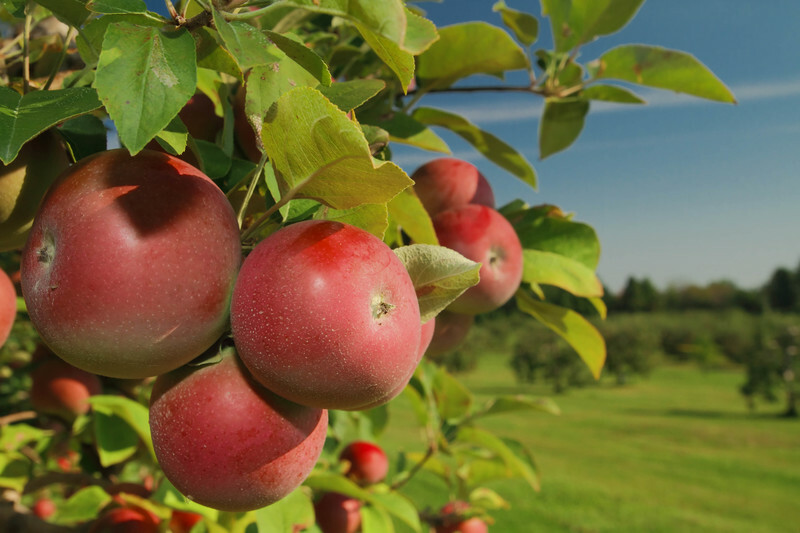 Tip: Leave your Apple Cider Vinegar by the window, the sun will help the "Mother" grow. Storage: Store in a cool dry place, keep out of reach of children. Estimated shelf life from purchase: 2 years. Q - What is Natural Apple Cider Vinegar? 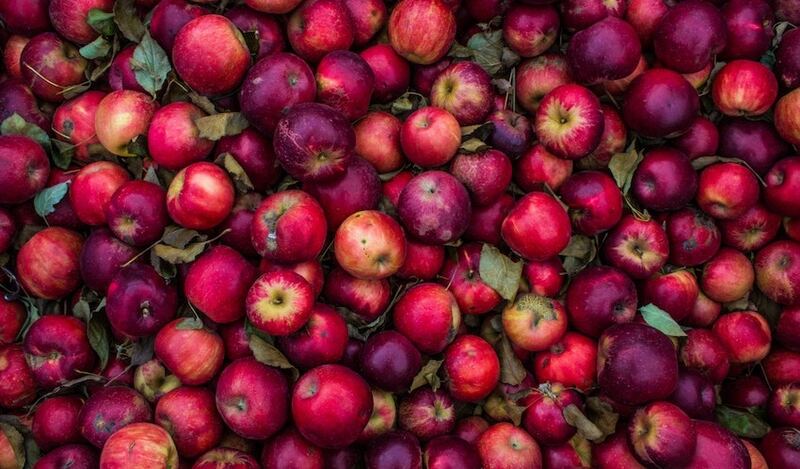 A - Different from the refined and distilled vinegars usually found in supermarkets, Natural Apple Cider Vinegar is made from fresh, crushed, organically grown apples and allowed to mature in tanks, which boosts its natural fermentation qualities. When mature, it contains a web-like substance, called "mother" that becomes visible when the rich brownish liquid is held to the light. Q - What is the nature of the Mother? A - The mother is the dark, cloudy substance in the Organic Apple Cider Vinegar formed from naturally occurring pectin and apple residues - it appears as molecules of protein connected in strand-like chains. The presence of the mother shows that the best part of the apple has not been destroyed. Vinegars containing the mother contain enzymes and minerals that other vinegars may not contain due to overprocessing, filtration and overheating. Q - Why is Apple Cider Vinegar not pasteurized? A - Pasteurization is the heating process intended to remove potential problem bacteria from consumable liquids such as milk, juices etc. 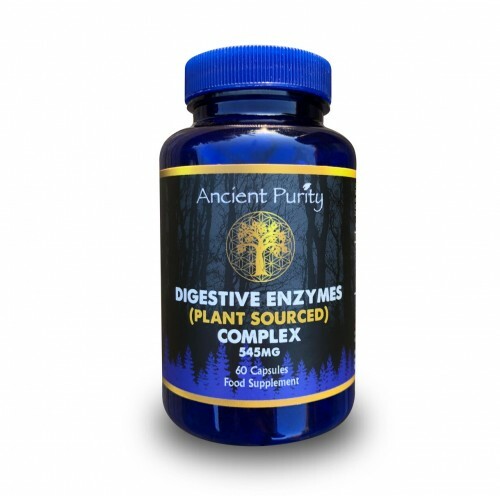 However, this process will also remove delicate nutrients and enzymes that may constitute a major portion of the food value of that consumed. In the case of Organic Apple Cider Vinegar, pasteurization would eliminate the "mother", a major health giving factor of our vinegar. Q - Is it okay to eat/drink the Mother? A - The mother is the most nutritious part of the Organic Apple Cider Vinegar and is very beneficial to digest. Often the ‘mother’ settles to the bottom of the bottle. We recommend shaking the bottle lightly to distribute the ‘mother’ before dispensing. 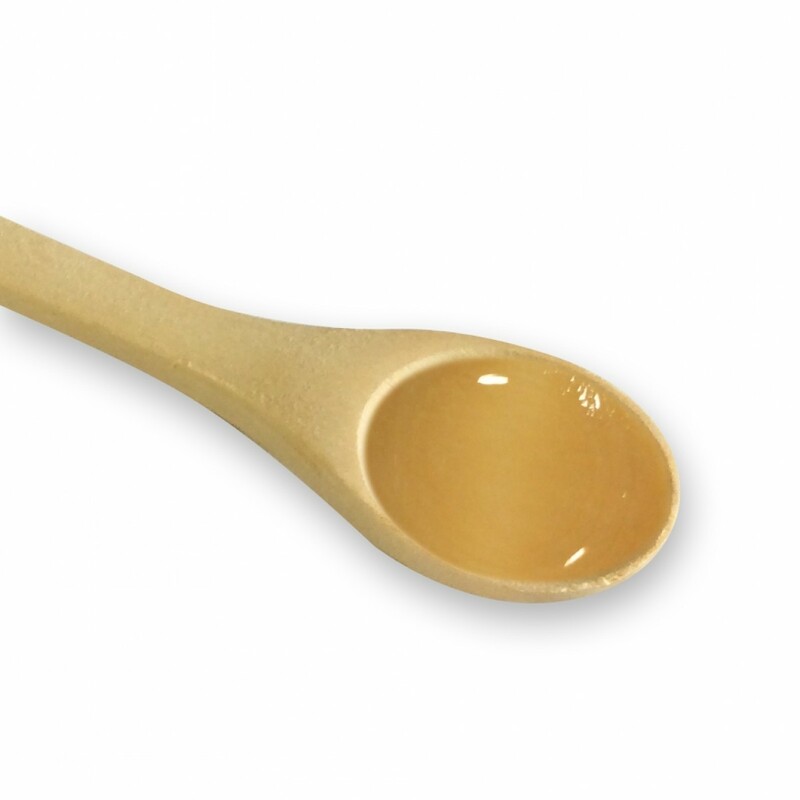 Q - Since Apple Cider Vinegar is unpasteurized, is it protected from E.Coli bacteria? A - Organic Apple Cider Vinegar does not carry the E.Coli bacteria as the acidity in the vinegar is effective in killing the 0-157 strain of E.Coli bacteria. Q - Does Apple Cider Vinegar need to be refrigerated? A - Our Organic Apple Cider Vinegar does not need to be refrigerated. We only recommend that you keep the product out of direct sunlight in a relatively cool location. Q - What is the shelf life of Apple Cider Vinegar? A - Organic Apple Cider Vinegar has an FDA required "official" shelf life of three to five years after the bottling date (found on the bottle), however, experience has shown that the product is safe, usable and effective for an indefinite period if kept out of direct sunlight.